– A full-size model of a NASA space shuttle may soon journey on the waterways of the United States, embarking on a mission of education and "Inspiration." 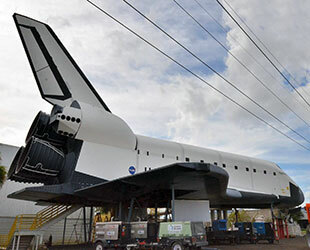 Pederson envisions outfitting the Inspiration with a state-of-the-art theater and touring it, atop a barge, up and down America's rivers to bring the 120-foot-long (40 m) mock-up to areas where people may have never seen a shuttle up-close and in-person. "To allow people to see this, take pictures and experience it," he told collectSPACE on Tuesday (Jan. 12). "I was told by astronauts that 'When it comes to my state, I would like to be there.'" Before that can happen though, LVX first has to save the Inspiration. 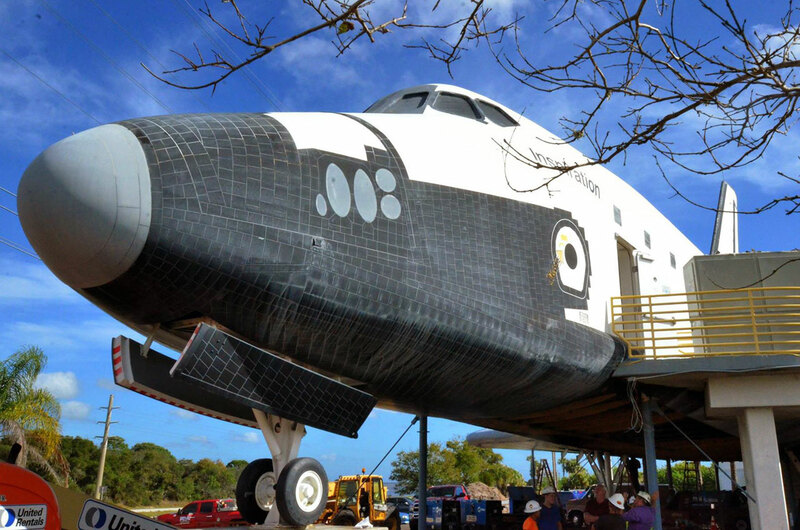 Installed outside the former Space Camp Florida and U.S. Astronaut Hall of Fame in 1992, the Inspiration debuted on display as the "Shuttle To Tomorrow." Installed in its cargo bay was a 72-seat theater wherein the public experienced their own astronaut adventure through a 12-minute, multi-sensory video presentation that featured the rumbling of a launch, a simulated spacewalk and more. Space Camp trainees also used the full-size space shuttle to stage simulated missions inside its detailed crew cabin (markings still faintly visible on its right, or starboard, wing show the name of another orbiter, Endeavour; a carryover from its use by the camp). Despite an upgrade and repairs made about 10 years ago, exposure to the elements and recent years of disuse left Inspiration in very poor condition. "It was so far gone it needed to be destroyed," Pederson explained. "When we [initially] expressed interest, we were denied its use because really, it was virtually condemned and it was set for destruction." Pederson pledged to NASA that if LVX could take control of the mock-up, they'd spend "a whole bunch of money on it and bring it up to its former glory" and then some. "We have already probably spent in excess of half a million dollars fixing it up," he revealed. "We will probably spend in the neighborhood of $5 million when it's all finished." Work has been underway to fortify the Inspiration so that it could survive even its initial move. 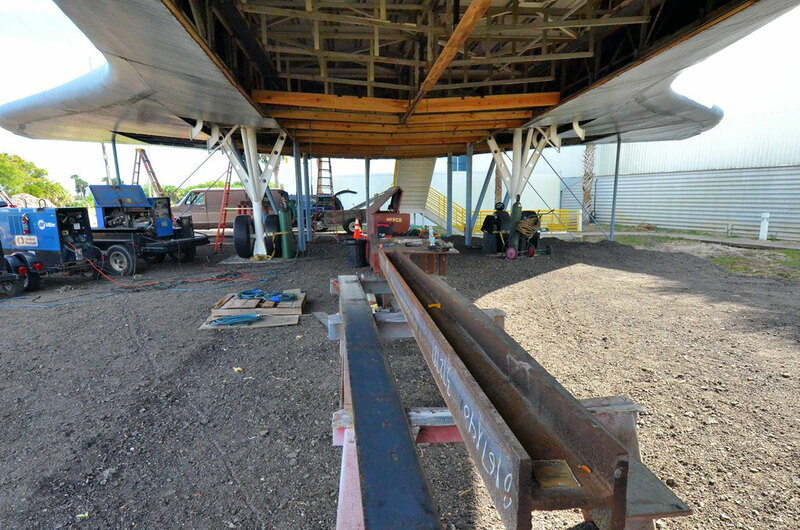 Some 20,000 pounds (9,100 kg) of steel and thousands of welds were added to the structure to ensure that it holds together. 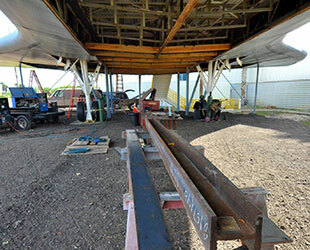 Beyel Brothers Crane and Rigging of Cocoa, Florida has been conducting the repairs and will be responsible for the move. 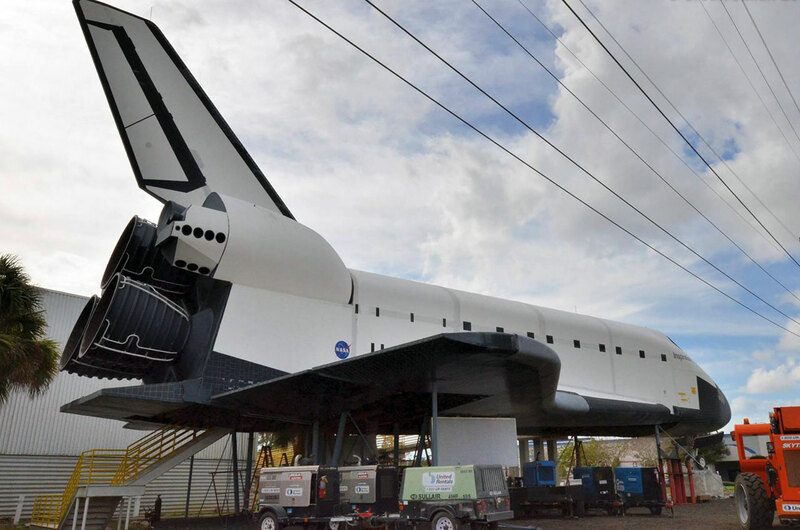 The company earlier transported another full-scale mock space shuttle, the Independence (formerly Explorer), which is now at Space Center Houston in Texas. 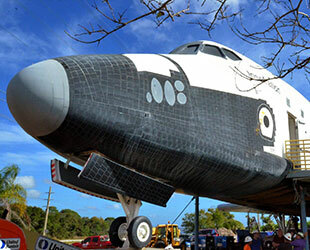 In 2012, Beyel was also tasked with the final move of NASA's real space shuttle Atlantis, which is displayed at the Kennedy Space Center Visitor Complex. Pending the weather, as well as possibly-needed permits and "politics," the Inspiration is targeted to start moving at 7 a.m. EST (1200 GMT) on Saturday for the 10 to 12 hour trip to Beyel's repair and upgrade facility on Merritt Island, located south of the space center. After exiting the property where it has sat for 20 years and clearing an overhead power line, the model orbiter will be moved by multi-wheeled transporter about half a mile (0.8 km) to the shore of the Indian River, where a crane will be used to lift and load the shuttle onto a barge. From there, it is expected to take about four hours for Inspiration to cross the river. Pederson estimates that it may take upwards of a year to develop the plan for the Inspiration's tour and complete the work to upgrade it accordingly. 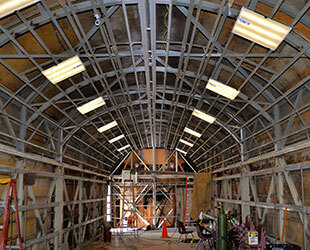 "We want to bring the flight and mid-deck to a very realistic and workable level," he said. 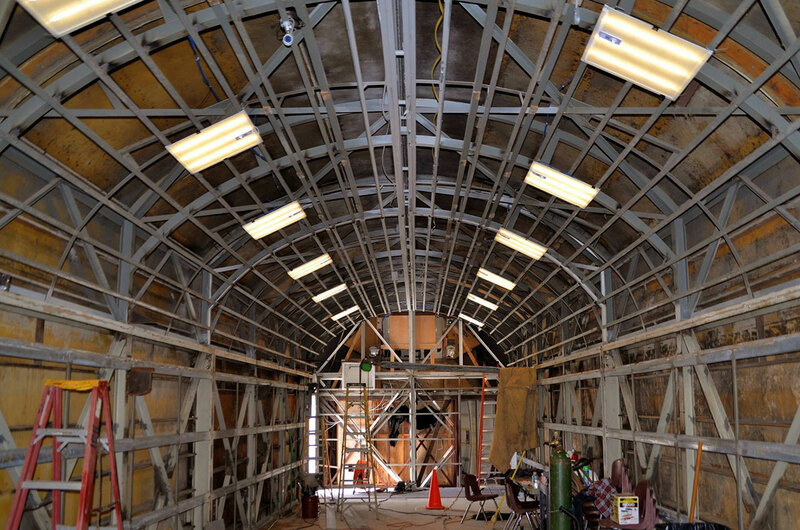 The payload bay will also be completely renovated to be a "immersive environment" where the floor, ceiling and walls envelop guests in a movie where the bay doors appear to open into space. Ultimately, Pederson hopes the Inspiration can deliver just that — inspiration for both the public's and his company's benefit. "What LVX looks to get out of this are two things," he said. "First, the satisfaction of just doing it, because I own LVX System and I love NASA." "Secondly, the credibility of having done this and bringing it to people," Pederson stated. "Of course, every corporation likes to have those kinds of things. That will be the fun part of it — bringing it to a lot of people who have probably never had the chance to see the space shuttle and giving them the chance to see one."